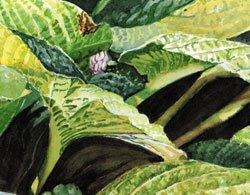 Monday I am teaching a watercolor workshop in a local garden which features beautiful hostas. This painting was done last winter from several reference photos I took while shooting reference pictures for a Garden Portrait. The first thing I did when working on this piece was to paint the under-washes. The main focal point, the large blue/green leaf on the left, was underpainted with a light wash of Cerulean Blue. I dropped in some Permanent Sap Green wet in wet to add some variety to the leaf and to enhance the shadowy area near the stem. The yellow leaves were underpainted with Aureolean Yellow and Quinicridone Gold. Then, hours were spent layering in the brush work to develop the leaves. Indigo, Vandyke Brown and Permanent Alizarin Crimson were used in glazes to develop the deep shadow areas behind the leaves. I loved studying the little abstract shapes and shadows around the nooks and crannies of the individual leaves. You can see some of the brushwork a little better in this detail. 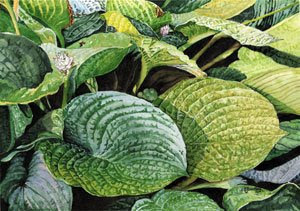 On Monday, during the workshop, students will be able to work on hostas in an overall scene or very close up. We will try to work on two different pieces during the day to study the changes in colors and focus as the light changes throughout the day.